BPDA provides information and advice on concrete pipes, manholes, box culverts, and other precast concrete drainage systems, including sustainable drainage systems (SuDS). BPDA is formed from the integration of the Concrete Pipeline Systems Association (CPSA) and the Box Culvert Association (BCA). BPDA takes its place as one of the specialist product groups within the British Precast Concrete Federation. 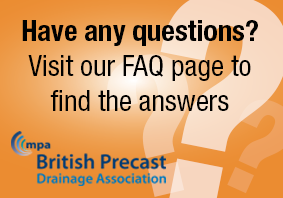 This British Precast Drainage Association website provides information to help you design, install and maintain concrete drainage systems. It also offers useful information and case studies. Click here to find out more.